Strong Santa Ana winds, low humidity and warm temperatures prompted the National Weather Service to issue a red flag fire warning for Monday in San Diego County. The red flag warning goes into into effect at 3 a.m. Monday and will last until 8 p.m. Tuesday for the county’s mountains and valleys. Northeast winds of 15 to 30 miles per hour were expected Monday morning through Tuesday night, with gusts of 45 to 50 miles per hour, according to the weather service. Humidity was expected to drop below 10 percent Monday. “While recent rains have reduced the risk for significant fire in most areas, it has not been eliminated,” the weather service said. 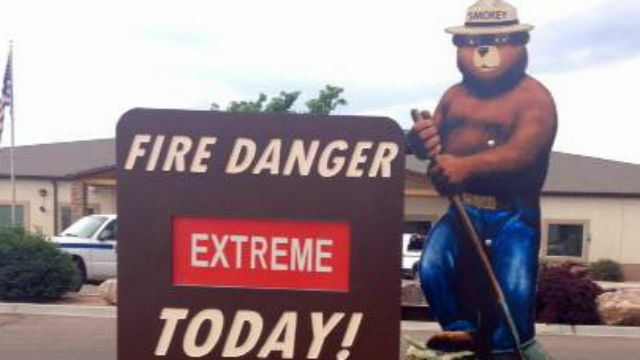 Warm temperatures were also expected to add to the potential fire danger. High temperatures Monday will be 75 to 81 in the western valleys and foothills, 60 to 67 in the mountains and 78 in the deserts, weather service forecasters said. A San Diego Gas & Electric representative said the utility was not planning to shut down any power lines ahead of the fire weather, but will be on standby in case of an emergency. “We don’t have anything planned to proactively shut down lines, but we are going to be fully staffed in the event that the weather is severe and we need to make any efforts,” SDGE spokeswoman Sabra Lattos told City News Service. Winds were predicted to gradually decrease Tuesday night and Wednesday, and conditions will be warm and sunny the remainder of the week, forecasters said.